Spring Into Action: Fill Those Potholes! It's quite simple: potholes need filling in to stop them from being a safety risk and from damaging property. Twistfix has the answer in the form of Ultra Crete Permanent Pothole Repair, a truly professional solution that is used all over the UK by householders, private contractors, industries, local authorities and councils alike. As you'd expect, the material makes it easy to effect an efficient and lasting repair. Potholes really cannot be avoided, particularly in areas of heavy traffic. Vibrations create small hairline fractures, the edges of which soon work loose to allow water inside. In the best case scenario, this water will start to erode the material beneath; things progress much quicker as a result of the dreaded freeze/thaw cycle. Either way the result is the same: the cracks get wider and let more water in, progressively widening cracks. Further vibration adds more to the mix, damaging the surface material and resulting in the ubiquitous pothole. Potholes are especially dangerous to pedestrians, particularly children, the elderly and those with impaired mobility. They also represent a danger to cars, which can easily become damaged as loose material is dislodged to strike the surfaces and the delicate underneath of the vehicle. Every time a vehicle drives over (and through) a pothole, that pothole becomes ever wider and thus more dangerous. 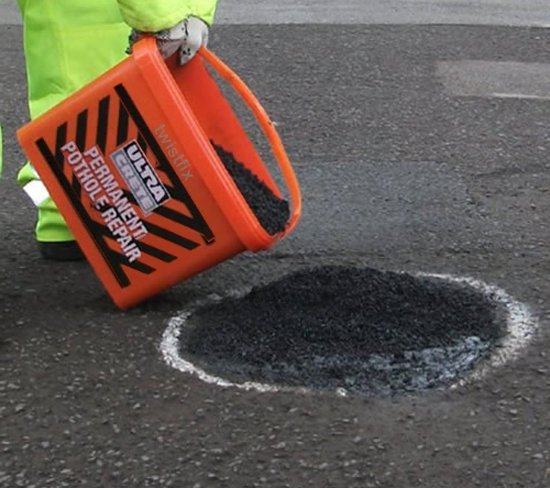 Permanent Pothole Repair from Twistfix comprises a cold-lay asphalt, supplied in a resealable, recyclable 25kg tub. It can be used in any weather conditions and provides that all-important repair to a wide variety of surfaces, including driveways, car parks, courtyards, sports courts and more, as well as those already mentioned earlier. Once in place, the repair formula helps to stop a recurrence of the damage. For just £46.50 fully inclusive of VAT, you can get your hands on a 25kg tub of Ultra Crete Permanent Pothole Repair. For a complete package at a special price, check out our Asphalt Repair Kit too.